v) XCH(10 marks) 4 (a) A process control system illustrated in figure 1 is desired to fill the bottle and convey this. 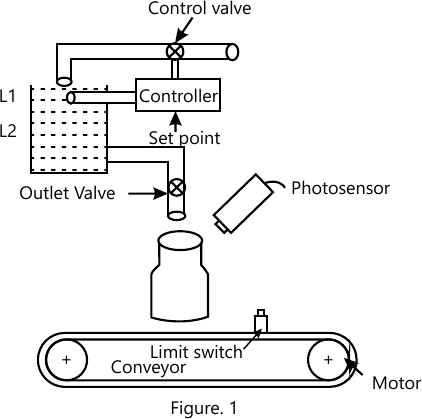 The outlet valve is opened to fill the bottle as when the limit switch senses the presence of bottle and is closed automatically when the photosensor produces the signal as when the bottle is filled. The level of water in tank is maintained through a control valve. Develop a PLC ladder logic diagram for this control application.